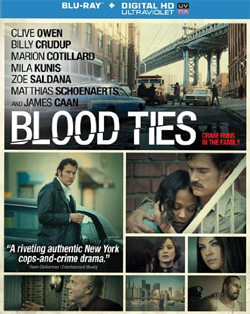 (Release Date: June 24, 2014)  "Blood Ties" has one of the best acting ensembles of the year. Christoph Offenstein's golden-hued camerawork sparks with a lushly textured visual grittiness. The film's detailed period depiction of 1974 New York is so meticulously woven into each framefrom the production design and set decoration, to the wardrobe, to the complementary soundtrackthat it might as well have been shot in the very decade in which it is set. Director Guillaume Canet's (2008's "Tell No One") first English-language feature is permeated, above all, by his skill in working with his actors, each one giving a solid performance even when their roles are underwritten or tend to fall to the wayside in the narrative. At 127 minutes, the picture flirts with the sprawling ambitions of a character-focused crime epic, but its tangled web of subplots come and go, sometimes entirely forgotten about or not satisfactorily dealt with. There is a more complete version of this uneven, always enthralling, dramaindeed, the one that played at the 2013 Cannes Film Festival ran 17 minutes longerbut the skill in front of and behind the camera is nonetheless always apparent in the trimmed cut that finally saw U.S. release. Shot primarily with the Arri Alexa Plus camera, "Blood Ties" achieves the grimy, sultry feel of 1970s New York. The Blu-ray's 1080p transfer knocks it out of the park, flawlessly emulating every aesthetic intention of Christoph Offenstein's vivid, sepia-toned lensing. The film looks so good, in fact, that there should be no other option when deciding how to view the film. One wouldn't think that the 5.1 DTS-HD Master Audio wouldn't get much of a chance to work its magic during what is ostensibly a dialogue-heavy drama, but this is not so. From the literally explosive opening scene scored to Ace Frehley's "New York Groove," the sound mix is robust and active. The era-specific songs have never sounded better, dialogue is emphasized with clarity, and the car chases and handful of action set-pieces are alive with range and depth on all surround channels. "Blood Ties" is a good film that could have been great with a little extra fine-tuning on the screenwriting and editing fronts. Nevertheless, it is an involving, star-studded crime saga that unfairly slipped under the radar during its limited theatrical release. Now that the picture is looking and sounding as great as can be on Lionsgate's Blu-ray release, it is worth checking out. Recommended.